Hip arthroscopy – what is it? 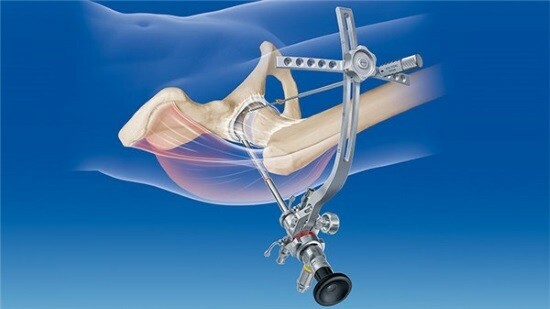 Hip arthroscopy is a modern minimally invasive method of examination and treatment of diseases of the eponymous joint. In this procedure, the attending doctor is able to visually inspect the intraarticular cavity and detect its pathological changes associated with various diseases. Endoscopic surgery techniques have a high efficacy and low risk of complications. Hip arthroscopy, like any other endoscopic intervention is performed using small endoscopes. These devices are thin flexible probe having at its end a video camera and lighting source, allowing the surgeon to visually monitor the progress of the procedure and to assess the condition of the joint. Violation of the integrity of the cartilaginous structures or the ligaments inside the hip joint. Chronic inflammation on the articular surfaces. Remove cartilage or bone from the joint cavity when they are apart. The need for excision of adhesions and growths on the articular surfaces. Arthrosis and arthritis of any causation. Fusion of the joint space or connective tissue of the bone. Suppurative inflammation in the affected joint or inside it. Decompensated diseases of the cardiovascular system. In the presence of these contraindications from the endoscopy must be abandoned in favor of other diagnostic methods. The most important stage of preparing a person for performing hip arthroscopy – a conversation with the surgeon and the anesthesiologist explaining to the patient the essence of the forthcoming investigation, the possible alternatives and complications. After that, the patient must sign documents on their agreement to conduct the survey. Everyone for one or two days prior to study must undergo a General clinical examination and blood and urine to identify abnormalities in the internal organs. Same patient is shown electrocardiogram. Proper collection of patient’s complaints and clinical examination, reduce to the minimum the risk of severe consequences for human health. It is desirable to prepare in advance the crutches to the patient, as some time after research is needed to reduce the load on the lower limb subjected to arthroscopy. Most often, a similar study is conducted using General anesthesia. The patient was placed on the healthy side. Using special supports for the foot, lower limb set in the most optimal position to access the hip joint. Conduct an initial marking of the projection of the edges of the joint, as well as estimated points to puncture, to reduce the risk of mechanical damage to soft tissues. In the beginning of the operation, using a special syringe with a long needle, into the joint cavity is injected a weak solution of adrenalin, to further expand the joint space. Then spend a few small incisions in the skin through which the arthroscope is introduced, which is a flexible tube with a source of illumination and a video camera. Can also be introduced additional tools that differ in various operations. After arthroscopy instruments carefully withdrawn, and the incisions are carefully sewn with a leather. It is very important to follow proper technique the manipulation to prevent the development of operative and postoperative complications. One of the most common complications include chronic inflammatory state, which may occur as the beginning of the inflammatory process in the skin in the area of introduction of the arthroscope, so ive intraarticular cavity. When applied to the skin incisions and the introduction of tools may damage the blood vessels with the development of external or intra-articular bleeding. READ MRI in stroke: types that will show research? Intra-articular inflammatory changes (synovitis, arthritis, etc.). Reduced range of motion in the operated joint. The emergence of such complications requires the surgeon stop the procedure, and providing appropriate special assistance. The most important measure of prevention of complications is the observation of all indications and contraindications to procedure and adherence to standards of execution. The adequacy of anesthesia and the qualifications of operating personnel are the key factors determining the success of arthroscopy. Hip arthroscopy is one of the most popular minimally invasive methods of research of the state of the same name of the joint, and also perform small surgical procedures in it. A good clinical examination of the patient, identifying possible contraindications and highly qualified surgical specialist reduce the risk of any complications to a minimum which positively affects the prognosis of treatment. And it is this, combined with good tolerability by most patients and the low invasiveness of the whole method, and determines the popularity of a similar survey among doctors and among patients. Knee arthroscopy – what is it for?